In an scenario of agile development, new versions are frequently released and deployed, and continuous changes in your database schema are frequent. To deal with these database changes, a mechanism should be in place. In Ruby on Rails, you have it out-of-the-box and it works great. But in Java web apps, you have to find a solution and plug it in your own projects. If we use hibernate and the hibernate3-maven-plugin, during development our database schema is automatically kept up-to-date: hibernte3-maven-plugin extracts schema info from JPA annotations and hibernate configuration. We will use a project based on the AppFuse framework, with flavours for Spring MVC, Struts2, Tapestry, JSF, but this is applicable to any java web app based on any framework. By inspecting the project's pom.xml, we can see the database schema is kept up-to-date during development by generating drop and create DDL commands, extracted from the JPA annotations in our model classes. We will be evolving our app and when we have something to commit and push to our project's global repo, we can then generate the database migrations, if any. The first time we deploy the app, it will contain the initial db changelog for an empty schema. Liquibase will generate all the db tables and populate with initial database data (default users, user roles, any lookup tables...). On subsequent deployments, our app will contain an additional db changelog to bring the server database schema up-to-date. Liquibase can perform automatic db update at runtime by looking at the registered change sets in a changelog file and checking if they are applied against a table in our schema called DATABASECHANGELOG. It will create it automatically if it does not exist. We can implement the automatic db update either with a Spring bean or with a Servlet listener. During development, we will possible be making many changes to our app. We do not want to spend time for now on db migrations. 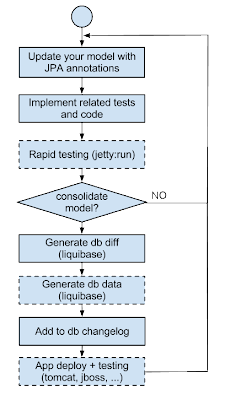 Just evolve our model, annotate it with JPA and when doing rapid testing with jetty:run, generate the db from scratch. Liquibase maintains a table with applied change sets to our database. Based on the contents of that table, on startup our app will run liquibase to apply any missing migration to our db. And now we want to generate our db migration so we can consolidate our updated model. We will want our app ready to run a db update when deployed. Generate a mydb_prev schema, based on the current liquibase registered changelogs. We'll do this in a specific maven profile (db-diff), so we can activate it at any time to generate the db changelogs. I omit the buildnumber-maven-plugin config in our pom.xml at validate phase so that we can generate unique changelog filenames based on current timestamp. Many web apps will have a set of data preloaded in the db: initial set of internal user accounts, available user roles, list of applicable taxes, ... whatever. These can also be defined as a changesets so that Liquibase can update the database for us when running our app. In AppFuse, the profile prod feeds the database with production data instead of test data. We use this profile to regenerate the db and populate it with production data. After this, we can use the db-data profile to generate our changelog for the initial db data. dumps all data. You will have to keep only the added data to your db from the previous db version. No diff here performed by Liquibase. Our app is now ready to perform all registered db migrations when deployed in a server. 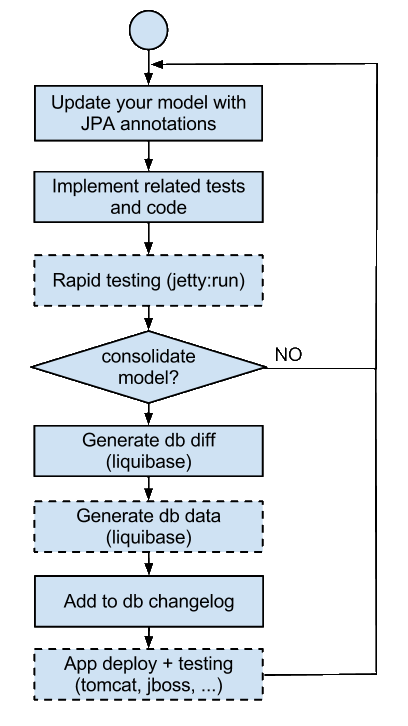 However, it would be nice too to exercise this during development when we launch a jetty:run for rapid testing of our unpackaged app. The logs show Liquibase has updated our db successfully. Your db schema will usually be specified in your jdbc connection parameters. You better erase these or you will run into trouble if you set a different schema name in your jdbc configuration file. It is up-to-date, as opposed to the liquibase site documentation. If any of these is different, it will try to re-apply the changeset. If you want to avoid this, you can clear the corresponding fields in the db table and liquibase will refill them with the actual values. To avoid differences in filename because of different path (relative vs absolute path, path updtes, etc), you can set the logicalFilePath attribute of the in each liquibase file. There is no parameter to omit the path of changelog files in an applied changeset. I also like to consolidate a set of related changesets from a changelog file in a single changeset. Instead of having many changesets, each one creating a table, creating an index, creating a referential integrity, etc, I tend to group many of these updates as a single changeset. Liquibase autogenerates a numeric id to identify each changeset. I prefer to assign it a timestamp, as it gives more info and they still appear ordered. Here in this blog they have given the best introduction on automatic DB migration for java web which can be useful for anyone who is studying or making reports on this.thanks for such a nice post. Is the source repository in Bitbucket still operational? Failed to clone it with error message saying repository doesn't exist. The Bitbucket repo is still operational. Hope you found your way! "[ERROR] Failed to execute goal org.liquibase:liquibase-maven-plugin:3.3.5:diff (default-cli) on project vacation-club-web: Execution default-cli of goal org.liquibase:liquibase-maven-plugin:3.3.5:diff failed: A required class was missing while executing org.liquibase:liquibase-maven-plugin:3.3.5:diff: org/springframework/orm/jpa/persistenceunit/DefaultPersistenceUnitManager"
Thanks for trying out. As this article was written some time ago and the versions are different, you may need to add additional dependencies in pom.xml to the liquibase plugin.